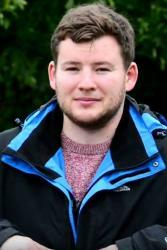 PhD students Paul GeorgeA Canadian student with Welsh roots, is breaking new ground in his research to assess exactly what lives in the Welsh soil beneath our feet. Paul’s research looks at the smallest species, which live in the soil, including bacteria, fungi and animals. His work puts Wales at the forefront when it comes to understanding what controls where these microscopic species occur across the landscape at a national scale. And that’s a lot of species as it is estimated that a quarter of all species on land live within our soils. Why do soils matter? Soil condition is a global indicator for land degradation within the UN Sustainable Development Goals. Wales is one of the few governments globally which protects soils at the highest level as it includes soil condition as one of its ‘46 National Indicators’ for ensuring sustainable development and the delivery of the innovative Well-being of Future Generations Act 2015. How does one search for, identify and classify organisms too small to be seen? By using molecular metabarcoding- which involves taking a ‘handful of earth’ or soil and assigning a DNA ‘barcode’ to everything contained within the sample. This could include DNA fragments from species which have recently been in the earth as well as identifying anything still present. Over the course of Paul’s research, 100 million soil organisms, including 29,690 types of bacteria and 7,582 types of fungi have been identified. Plectus sp. 200X magnification. 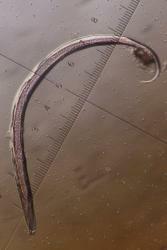 Nematodes are a major component of soil biodiversity. They are important links in the decomposition food web and can be major consumers of smaller organisms or disease agents of plants and animals.“Surprisingly, we found a far richer variety and number of microbial species in agricultural soils than in woodland, bogs and conservation land. We don’t yet know exactly why this is- it could be due to agriculture being present on soil types which are more inherently suited to supporting a larger number of species or, the management practices we use in agriculture creates more varied habitats for different species to exploit. Paul George is funded through the STARS Centre for Doctoral Training. His work forms part of the Glastir Monitoring and Evaluation Programme (GMEP). 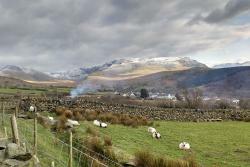 GMEP was funded by Welsh Government to assess the impacts of their recent agri-environment scheme, Glastir and led by the Centre for Ecology and Hydrology (CEH) in collaboration with universities, public research centres, scientific consultancies and voluntary bodies.